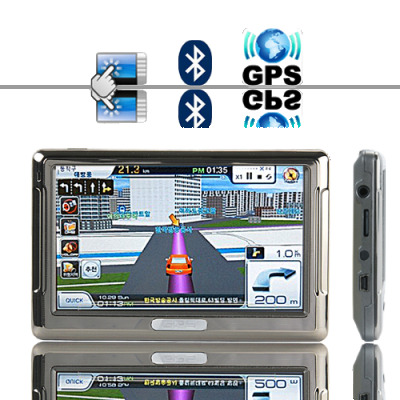 Successfully Added Galileo 5 Inch Touch Screen Multimedia GPS Navigator w/Bluetooth to your Shopping Cart. Designed to perfection. Drive in style and comfort with the Galileo GPS Navigator. Pushing technology to the edge and providing outstanding effortless performance to the end user. This sleek looking 5 inch touch screen portable GPS navigator comes in a dark Grey color, and with a uniquely designed dynamic menu interface. The Galileo comes with everything you need from a hand held GPS navigator. Embedded with multiple media applications such as, MP3 MP4 player, FM transmitter and Bluetooth for hands free calling when driving. The Bluetooth feature on the Galileo allows for importing contacts from your cellphones phone book and view recent calls, making it easy to access your contacts straight on the Galileo GPS multimedia navigator. Designed with all the powerful navigation functions you need, including spoken voice directions and automatic route re-calculation that gets you back on track quickly if you make a wrong turn. You'll also get the choice of 2D or 3D mapping that lets you find your way more easily. The Galileo GPS navigator also comes with a night mode feature, the night mode function allows your eyes to focus on the screen more comfortably in the dark. This superb elegant multimedia GPS navigator with Bluetooth instills confidence and joy in your driving. Let the Galileo guide you to your destination on time and stress free. This GPS navigator comes with an easy to mount bracket making it ever so easier to instantly install this high end GPS unit within seconds straight out of the box. The Galileo primary function is navigation, and is totally compatible with today's most popular GPS software such as TomTom, Route 66, iGo etc. While on the go, enjoy listening to your WMA and MP3 music files with either the earphones included, built-in speaker, or through your car's stereo system via the built in FM transmitter. When you have the Galileo as your travel partner, you safely arrive at your destination and have fun all at the same time. The Galileo GPS system can be used in the car as well as on travel. With this new portable GPS Navigator you have one unit than combines powerful GPS functionality with entertainment, portability and style. The CVMF-CS26 does it all and makes your daily life easier at the same time. The Galileo navigator will get you where you need to go whether you are driving, walking, biking, hiking, and on the train or bus, this one unit will tell you where you are and where you are going. This The Galileo GPS navigator makes a great product for singe/company use, resale market, online or physical store, and is available to you straight from the leaders in hand held GPS units, Chinavasion. The unit includes evaluation GPS software. We recommend purchasing or downloading a GPS software package from your home country that best covers your region of the world. Can be used with stylus or simple user input commands using your finger. No, one you are in the GPS mode, you cannot change music tracks, the music will be on continues play, after one song ends another begins automatically. The FM transmitter lets you listen to your favorite music through your cars stereo system. First, load your bonus 2GB micro SD card (Included) with your favorite digital media files. Then, load the FM transmitter application and tap the FM switch option. (Note: the frequency of the GPS unit FM transmitter and your cars radio must match in order to be able to listen to your music through your cars stereo system. on 2010-03-06 07:22:30 Chinavasion is my partner ! I have purchased many things also the GPS. It is a lot better than I expected. It is excellent GPS with super capabilities and reliability. Also the extra gift 2GB included card is a perfect attachment with all included goodies. The shipping from the Chinavasion is totally PERFECT from the packaging to shipping way and the included invoice with the proper total cost details for the customs. Chinavasion THANK you, you have another one extremely satisfied customer. Never had such an easy setup of a GPS System before! Started, choosed the target - within 2 minutes the guide started. Fast, easy. I live in Switzerland. Hope i can implement the POI's of my (ex-)GPS System. When someone is calling i got a message an can take the call over the Galileo. To call out i choose the person over the Galileo that has synchronized the contacs. Regarding the cost / performance ratio never had bought something attractive before. I received the device few days ago after 7 days from the order.This navigator fulfil the expectations, the gps works very good but the user guide/documentation is limited.